Malaria still poses a significant barrier to social and economic development in Ethiopia, despite recent reductions in malaria-related morbidity and mortality. Ethiopia aims to eliminate malaria by 2030, and is implementing essential malaria control and elimination interventions (such as improved case management) to achieve this goal. 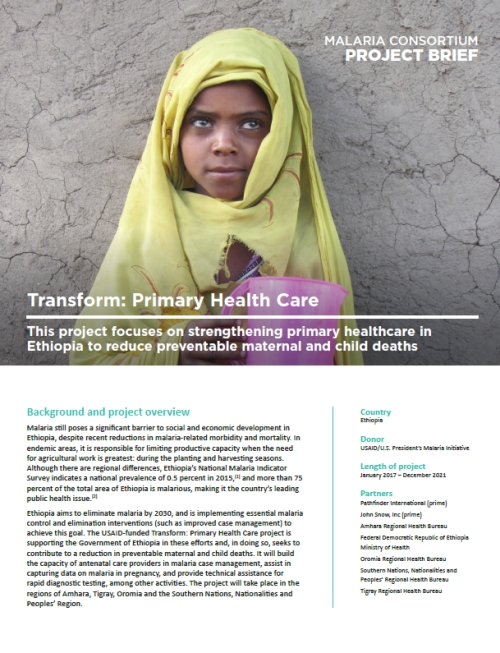 The USAID-funded Transform: Primary Health Care project is supporting the Government of Ethiopia in these efforts and, in doing so, seeks to contribute to a reduction in preventable maternal and child deaths.